Dachshunds are typically pregnant for 63 days before birthing puppies. 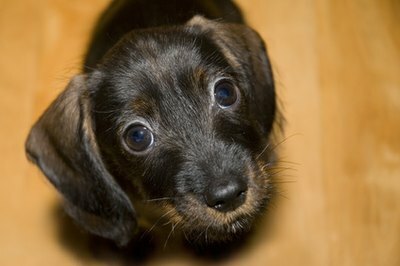 Dachshunds are sweet-natured and loving dogs, and dachshund puppies are exceptionally cute. If all goes well, the mother dachsie will take care of her newborn pups. You can be prepared to help as needed. Prepare a clean and comfortable whelping box for your dachshund's birthing. If you have the mother dog examined by a veterinarian during her pregnancy, you should know how many puppies she is expecting. Dachshunds commonly have five or six puppies in one litter. Assist the mother dachsie during birth if necessary. Most dogs will deal with the birthing process without help or intervention. When each puppy is born, the mother dog may bite the umbilical cord. Otherwise, you can assist by clamping the cord with forceps—at the width of one finger from the puppy—and then using scissors to cut the cord. If there is bleeding from the cord, dab it with iodine. Call a vet if the cord doesn't stop bleeding. Use a damp sponge to clean the mother dog after the last puppy is born. Make sure each newborn pup manages to start breathing independently. Typically, the mother dachshund will clear away the membrane and bag around the puppy—otherwise, be ready to do this yourself. Check the pup for signs of breathing. If a puppy isn't breathing, check the airway for obstruction. Massage the newborn's chest to stimulate breathing, and if necessary swing the puppy in your hands—head down—to dislodge mucus or foreign objects from the airway. Towel off the newborn pups to keep them warm and dry. Wet puppies can quickly become chilled, which can be life-threatening. Some breeders use a heat lamp over the whelping box to keep the newborn puppies warm. During birth, the room should be heated to at least 70 to 80 degrees Fahrenheit, and kept free of drafts. Encourage the puppies to feed from their mother as soon as possible after birth. Once the puppies are breathing and dry, you should guide them to the mother's teat so they can start to drink milk. If puppies will not feed—or if the mother dachsie will not allow them to feed—you can give them puppy milk prepared from powder. Feed newborn pups from a feeding bottle every two hours. Feed the mother dachsie a diet rich in protein and calcium as she continues to nurse the young puppies. She needs calcium to replenish her own body's stores, and protein is necessary to pass on to the pups via her milk. Weigh each puppy regularly using your scales. Each puppy should be gaining weight at a steady rate. If any individual pup stops gaining weight—or begins to lose—seek veterinary help. Make sure that all puppies have the opportunity to feed from the mother—smaller or weaker pups may need your help to get their turn at the teat. Newborn dachsies will usually open their eyes around the tenth day after birth. Get your puppies vaccinated by a veterinarian when they are about eight weeks old. At this age, they can be separated from the mother dog and go to new homes. If the dam rejects a pup and does not allow it to feed, chances are there's something wrong with it. Take it to a vet as soon as possible. How Long Do New Puppies Need to Nurse?